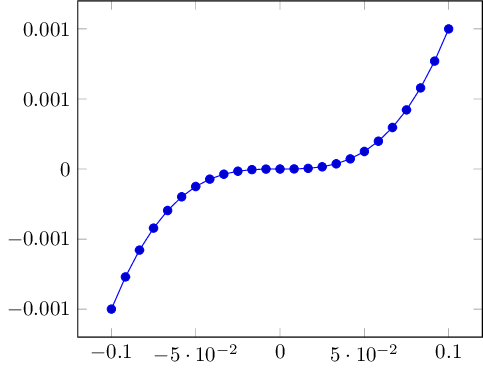 I have a plot whose y axis is linear with fixed precision and without scaling. The y tick labels are very little expressive because pgf rounded 0.0005 to 0.001 in the middle, producing contradictive labels. I do not really want to increase the precision (space constraints on the page), so apparently the best solution is to remove the middle "(-)0.001" ticks. Is there a pgfplots option to achieve this? One that says "do not place ticks such that the label gets rounded", "minimum difference between labels should be 0.001" or similar. There are literally 100 similar plots in my document coming from data which is subject to change, so manually specifying the y ticks is not the preferred option. Not the answer you're looking for? Browse other questions tagged tikz-pgf pgfplots or ask your own question. 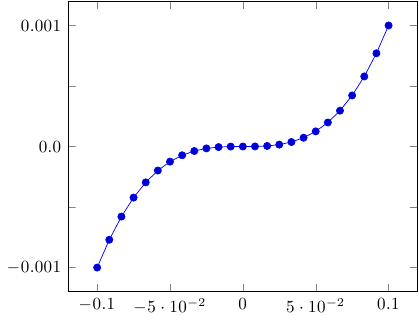 Location and size of pgf plot axis in a tikzpicture - with tikz positioning library? What exactly are the 'unsuitable tick labels' mentioned in pgfplots' compatibility warning? How to hide empty (value 0) ybars with pgfplots?